- The Shetland Sheepdog - or "Shelties" originated in the bleak Shetland Islands off the north east coast of Scotland, they're basically a smaller version of "Lassie" the famous Rough Collie dog breed although small is very capable of working as farm helpers and home protectors, this dog breed has also worked with the smaller Shetland ponies and other livestock from this region protecting flocks and herds from invaders of all kinds. 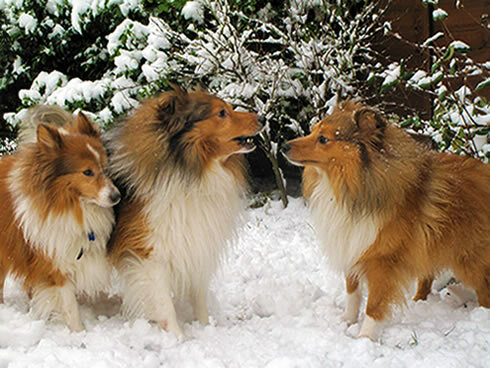 "Shelties" are vocal herding dogs and therefore can be very well trained to be excellent guard dogs. These dogs aren't just beautiful looking they are also intelligent little animals, as they trace back in history to the Border Collie breed, and like the Shetland ponies were miniaturized, shelties in this case were crossed with the Collies and other small intelligent breeds that in-time the breed evolved and was perfected. Shelties have thick double coats that come in many different colors and marking patterns these dogs are very loyal to there owners and are always ready and willing to please . This beautiful little dog will get along with people of all ages being watchful and making themselves very good companions. This kind of breed requires regular grooming due to it's dense double coat.